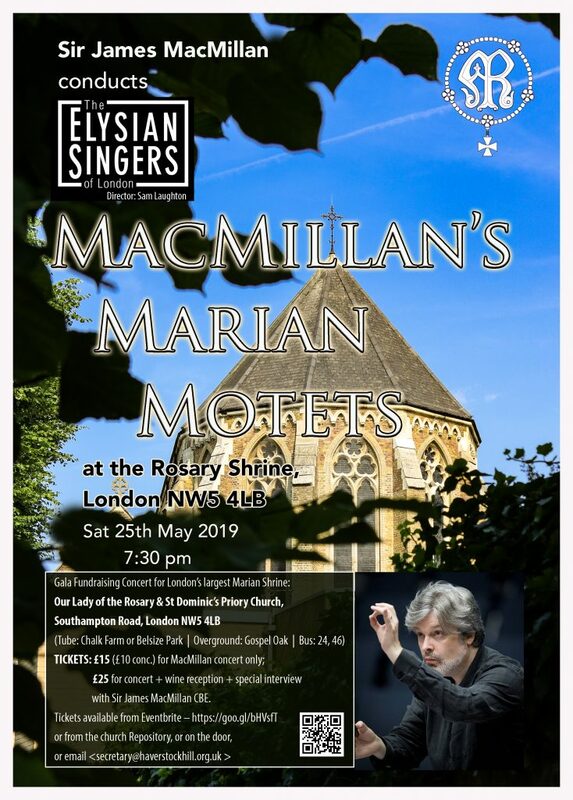 The Rosary Shrine is delighted to announce that Sir James MacMillan CBE, one of the country’s most successful and highly-acclaimed composers and conductors, will be coming to conduct a concert sung by one of London’s top chamber choirs specially selected by Sir James, called The Elysian Singers. They will perform an hour of MacMillan’s music written in honour of Mary, the Mother of God. The concert, starting at 7:30pm in the church, will be on 25th May, in the month of the Blessed Virgin Mary, and ticket sales will go towards the Rosary Shrine Fund, which pays for the on-going renovation and renewal of this beautiful Victorian church. £15 (£10 conc.) for the MacMillan concert only; or £25 for the concert followed by a wine reception in the parish Hall, and admission to an interview with Sir James, during which he will speak about his musical influences, his Catholic faith, and the stories behind the motets performed in the concert. It will be possible on the day to add on to the £15 ticket if you decide to attend the wine reception and/or the interview.